Oslo studio Rever & Drage Architects used a variety of cladding materials and traditional construction techniques to distinguish the different functional spaces at this mountain cabin in Norway's Sunndal region. 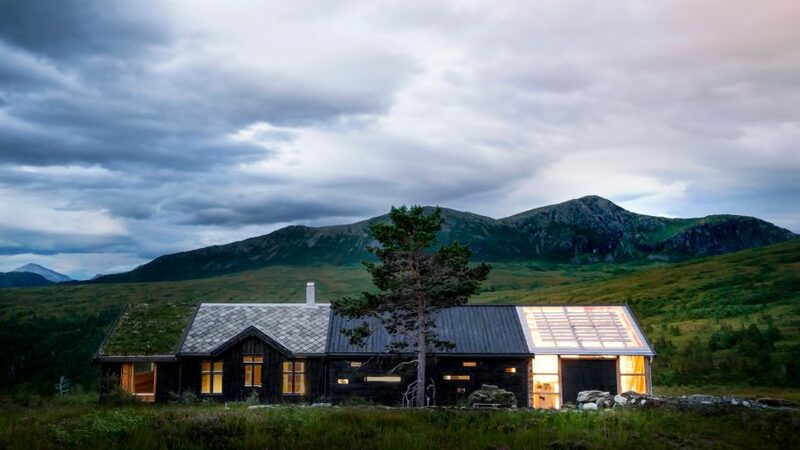 Rever & Drage Architects designed the Cabin at Troll's Peak for an active family who enjoy hiking and skiing in the mountains of the Trolltindane ridge. A key requirement of the design was to ensure the building is robust enough to withstand the area's harsh climate, while fulfilling its function as a place for resting, changing and storing equipment. The cabin features several spaces arranged in a sequence that addresses the needs of the family as they arrive back from their activities. A transparent garage at one end provides a place to leave their gear before they pass though a laundry area, bathroom and kitchen on the way to a lounge that looks out across the surrounding landscape. Each area is constructed differently and clad in materials chosen in response to its function and the weather conditions it is are exposed to. "The outside composition is that of a traditional row farm, where buildings with different functions and different construction techniques are arranged in a line corresponding with the dominant direction of wind," the architects explained. A dark-green tar-based oil is used to stain the timber boards that cover the majority of the cabin's facades, creating a sense of consistency that is enhanced by the identical pitches of the various roofs. "In the western facade of the building, the individual characters of the different units are most obvious," the studio added, "while in the eastern facade their coherence and the cabin as a whole is more prominent." "The cabin is in this respect can be seen as both a single unit and four separate buildings." Local timber and traditional building methods are used throughout the building, with saddle-notched logs forming the walls of three of the four sections. The different joinery techniques used for each area helps to lend them a unique character. "Furthest north, the notching technique is late-medieval, with large, narrowing logs," said the studio. "The living room is built with more elegant 19th-century notched logs, while the kitchen has slim, more modern, square logs with dovetail notches." The garage structure at the southern end of the building features an exposed timber frame constructed using a traditional method, which is wrapped in polycarbonate sheets to enable daylight to enter. The space can also be used as a storage area, fitness room, workshop and conservatory that offers views of the nearby Ryssdalsnebba mountain. Doors on either side can be opened in good weather to connect the interior with its wild surroundings. 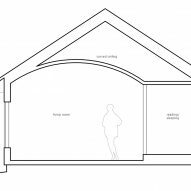 The living area can also be accessed using a dedicated entrance set in a gabled dormer that indicates its status as the main public route into the building. The entrance porch is flanked by two small rooms that can be used as additional bedrooms or studies. A kitchen next to the living room contains a dining table and a door leading out to a terrace. 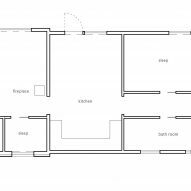 Small windows set into the western facade allow daylight to enter the kitchen and the adjacent bathroom whilst retaining a sense of privacy. Photography is by Tom Auger.